Neven Jakopovic presents impressive results of a scientific study of 5-year survival of patients with advanced and metastatic colon cancer and breast cancer. Patients taking large doses of medicinal mushroom extracts of Dr Myko San – Health from Mushrooms company lived much longer, with a higher quality of life. As a continuation of the study on the effects of mycotherapy in patients with colon cancer and breast cancer presented at the 4th International Conference on Medicinal Mushrooms (Ljubljana 2007), this study included 52 patients with colorectal cancer and 89 patients with breast cancer. They used Dr Myko San products Lentifom, Super Polyporin and Agarikon for 40 to 270 days (average of 70 days), with occasional inclusion of the products Agarikon and Agarikon Plus after intensive mycotherapy. Patients underwent intensive mycotherapy in the period from January 2005 to January 2006 (concurrent with or after standard oncological treatment), and were monitored until the end of December 2010. The analysis is based on the official medical records from hospitals where patients received standard oncological treatment, and information received from patients and their family members. 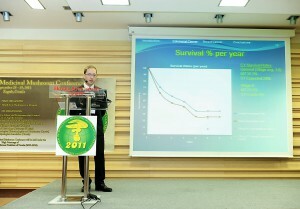 This follow-up study was presented at the 6th International Conference on Medicinal Mushrooms, Zagreb 2011. It was a great honor for Myko San company to organize this conference. This study was focused primarily on advanced cases of colon cancer. At the start of mycotherapy, 68% of patients were in the very advanced 4th stage of the disease, and 26% in the 3rd stage. In the middle of the study period (August 2007), 27 patients were alive, and at the end of the study period (December 2010), 10 were alive. Metastatic colon cancer most often spreads to the liver, which strongly reduces survival rate. Once metastases appear, chemotherapy can reduce them in only 16% of cases, often with grave hepatotoxic side effects (such as blue liver syndrome and steatohepatitis). In the subsample of patients with colon cancer including liver metastases, intensive mycotherapy resulted in regression in 20% of cases, without any hepatotoxic side effects. (This is not surprising as broad scientific evidence indicates that medicinal mushrooms are not harmful to the liver, and in fact protect the liver from damage). With regard to colon cancer, the American overall 5-year survival rate at the time of this study was 62% (source: National Cancer Institute and American Cancer Society), which is much higher than the rate of just 43% in Europe (European Journal of Cancer). The mean survival of patients with colon cancer in the US was 29.2 months (from the time of diagnosis), in comparison to 38 months in patients using the stated Dr Myko San mushroom extracts (calculated from the start of intensive mycotherapy). A prominent difference was observed in patients with stage 4 colon cancer (metastatic): the 5-year survival rate in the US using the standard oncological therapy was just 5–8%, in comparison to 26.5% survival in patients intensively using medicinal mushroom extracts. (It should be noted that the difference would be even higher if we had available information on the time of diagnosis, i.e. that the American statistic was not compared with the effects measured from the start of mycotherapy, with a delay of 6 to 12 months!). In 42% of patients in our study, the primary tumour was removed surgically, while 56% of patients were in stage 4 of the disease (most advanced and progressed stage, with at least one remote metastasis). At the middle of the study period (August 2007), there were 50 patients with metastatic breast cancer, while at the end of the study (December 2010), 21 were alive. Chemotherapy is the primary treatment for metastatic breast cancer, and it leads to regression of metastases in 1–3% of cases. However, amongst patients taking intensive mycotherapy of the Dr Myko San mushroom extracts, the regression of metastasis was registered in 20% of cases. The 5-year survival rate of patients with metastatic breast cancer in the US (calculated from the time of diagnosis) at that time was 14% (Lippman, Harrison’s Principles of Internal Medicine, 2005). Patients using intensive mycotherapy with mushrooms extracts had a survival rate of 20% (calculated from the start of taking mushroom extracts, in most cases 6 – 12 months after diagnosis!). The use of high doses of medicinal mushroom extracts over a long period of time is completely safe and harmless. The initial effects are quickly evident after the start of mycotherapy (if it lasts at least 40 – 60 days). The effects are dose-dependent: higher doses over longer periods of time achieve better results. For more details, please see the presentation.